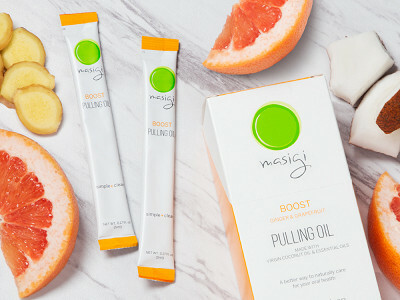 Get in on the coconut oil pulling trend with Masigi’s perfectly-portioned packages. “What is oil pulling?” you might ask. For the uninitiated, it’s an ancient oral care practice of swishing with coconut oil and “pulling” it between your teeth. It can remove toxins, whiten teeth, strengthen the jaws, and even clear sinuses. You could scoop solid coconut oil out of a jar, then put it in your mouth to liquefy. Or you could use the tidier, more precise packets from Masigi. Their single-serve tubes have a perfect portion of coconut oil, with added organic essential oil to enhance the flavor. Before you open the package, warm the oil between your palms to make it liquid. As for the science behind oil pulling, it’s simple. The microorganisms living in your mouth are covered in a fatty membrane. When another fat (i.e., the coconut oil) touches them, they stick together. Swish moderately for 10 to 20 minutes to sweep up those toxins, then spit the oil out. It’s important to remember that while coconut oil benefits you, it won’t benefit your home’s plumbing. Always dispose of the oil in a trashcan, not the toilet or sink. Hello everyone! I'm proud to introduce Masigi Coconut Pulling Oil to The Grommet. I'd be happy to answer any questions you may have! Oil pulling is a suggestive misnomer, implying that something bad is being pulled from the mouth (toxins and bacteria). What little scientific evidence exists shows that it is probably not as effective as standard mouth wash, and what benefit it has is likely entirely due to the mechanical act of swishing to remove particles and bacteria from teeth and gums. There is no reason either theoretically or based upon any evidence to recommend oil pulling (which should be renamed “oil-swishing”) instead of standard modern health care with flossing, tooth-brushing, and mouth rinse. However, it does appear to be better than nothing, and might have a role in developing countries without access to modern oral care. The one caveat is that extended periods of swishing that are commonly recommended (10-20 minutes) are likely not necessary and further present a risk of lipoid pneumonia from accidentally breathing in small amounts of oil. Oil pulling for general health or any other indication is pure pseudoscience. Detox claims are based on nothing, as are all detox claims. There is no evidence or plausible rationale to recommend oil pulling for any indication other than as a poor substitute for oral care. @John I wonder is you have ever tried it, John? It has spared me a root canal and it does whiten my teeth, and seems to clean better than flossing. No 'scientific' evidence, just real life experience. @jane How on earth can coconut oil spare you a root canal? These JUNK SCIENCE claims are just a lot of ignorance! "They were divided randomly into the study or oil pulling group (Group I) and the control or chlorhexidine group (Group II) with 10 subjects in each group. Plaque index and modified gingival index scores were recorded for the 20 subjects and baseline plaque samples were also collected. There was a statistically significant reduction of the pre- and post-values of the plaque and modified gingival index scores in both the study and control groups (p < 0.001 in both). The oil pulling therapy showed a reduction in the plaque index, modified gingival scores, and total colony count of aerobic microorganisms in the plaque of adolescents with plaque-induced gingivitis." For chemo patients there are times when you cannot even brush your teeth or use a conventional mouthwash because of the pain. I would definitely have purchased this during chemo just for the convenience. @john @raetta Thanks for your comments. Oil pulling is an ancient Ayurvedic medicinal practice that has been around for thousands of years. And yes, some people do call it oil swishing, although we like refer to it as oil pulling. We strongly believe in it because we’ve experienced the benefits personally. @John While you suggest there is no evidence to recommend oil pulling, there are actually quite a few scientific studies that conclude oil pulling does indeed benefit our oral health. Numerous studies have been published have proven a decrease in Streptococcus mutans (the main bacteria that causes tooth decay) due to oil pulling. You can see links to them on our website. There also have been books written expounding on the benefits of oil pulling (for example, Bruce Fife’s Oil Pulling Therapy.) There’s a growing movement of biological dentists that are concerned with the whole body effects of all dental materials and products we put in our mouths and are advocates of oil pulling. The ingredients found in mainstream mouthwash can include formaldehyde, phenol, cresol, ethanol, sodium lauryl sulfate, saccharin, and benzalkonium chloride. If you’re not familiar with those terms, they’re ingredients that make up disinfectants and preservatives, many of which aren’t safe for ingestion. Our pulling oil is made with 100% organic coconut oil and organic essential oils, nothing in there that will harm you. By the way, we do not recommend giving up standard oral care like brushing and flossing. @jane @christi We personally experienced the benefits of oil pulling as well. So happy that you have to! I have been pulling for about a year (no need for a name change to swishing for those in the know!). Not everyday and not always for 20 minutes...but like Christi, my dentist commented on the health of my teeth. I prefer coconut oil over mouthwash for the taste and the strength. I used to get horrible smelling tonsil stones which have completely subsided thanks to the oil pulling. I will definitely try these packets because they seem much cleaner & handier than what I use now. @liz Thanks for your input. Happy pulling is working for you, keep it up! @Barbara Fourteen in a pack. @Gaetano Yes, that's what we recommend. However, you can start with a few minutes and work your way up. It also helps to keep busy while you pull - read your emails, take a shower, etc. @Kathleen Thanks Kathleen! We wanted to make pulling accessible for travel. That's a great article, thanks for sharing. I am a big fan of Oil pulling and have been doing it for years. These packets make are great for travel. @Laureen Thanks so much! We are big fans of oil pulling too! 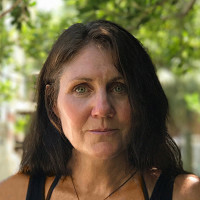 According to wedmd.com: "This oral therapy is a type of Ayurvedic medicine [a traditional Indian system] that dates back 3,000 years," says Jessica T. Emery, DMD, owner of Sugar Fix Dental Loft in Chicago. "It involves swishing approximately 1 tablespoon of oil -- typically coconut, sesame, or sunflower oil -- in your mouth for about 20 minutes and then spitting it out." Unlike some so-called natural home remedies, it's not a practice that's based on pseudo-science. Recent studies show that oil pulling helps against gingivitis, plaque, and microorganisms that cause bad breath. How? "Most microorganisms inhabiting the mouth consist of a single cell," Emery says. "Cells are covered with a lipid, or fatty, membrane, which is the cell's skin. When these cells come into contact with oil, a fat, they naturally adhere to each other." @Kristene We suggest rinsing with fresh water after you spit it out. @Leilani All good points! Thank you for sharing. What form of coconut oil do you use? I'm hoping it's organic virgin unrefined? @Joyce Yes, you got it right - we use organic virgin unrefined coconut oil and organic essential oils. 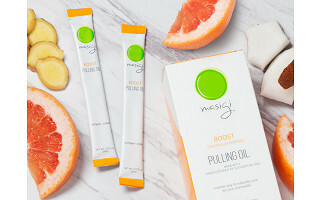 Get in on the coconut oil pulling trend with Masigi’s perfectly-portioned packages. “What is oil pulling?” you might ask. For the uninitiated, it’s an ancient oral care practice of swishing with coconut oil and “pulling” it between your teeth. It can remove toxins, whiten teeth, strengthen the jaws, and even clear sinuses. You could scoop solid coconut oil out of a jar, then put it in your mouth to liquefy. Or you could use the tidier, more precise packets from Masigi. 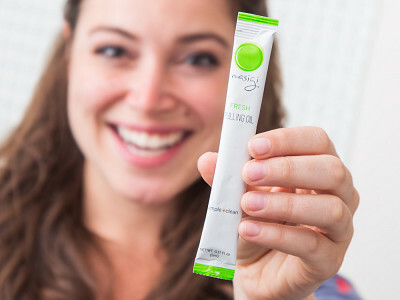 Their single-serve tubes have a perfect portion of coconut oil, with added organic essential oil to enhance the flavor. Before you open the package, warm the oil between your palms to make it liquid.